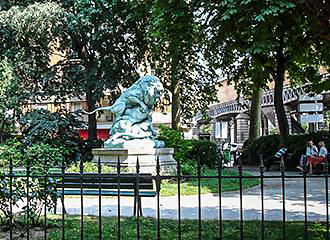 The Square Cambronne is dedicated to a French General and has an animal statue of a lion located within it, which was produced from a plaster cast that had been donated to the city of Paris, and the square with its chestnut trees and Italian poplars is located directly opposite another called the Square Garibaldi. According to the plaque from the Mairie de Paris positioned at the entrance of the square, it was first created in 1881 and this square in Paris was named in honour of Pierre Jacques Cambronne, the Viscount Cambronne. He was a French General that fought during the French Revolution and also during the reign of Napoleon Bonaparte and was wounded during the Battle of Waterloo, yet he also served under King Louis XVIII before retiring to Nantes which is where he was born and died. 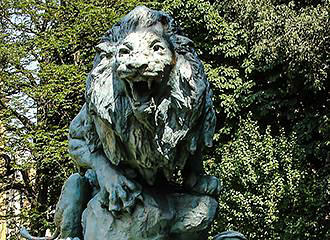 There is an animal statue group located within the Square Cambronne, which is called Drame au Desert, which translates in English to Drama in the Desert, yet it is also sometimes referred to as Arab in the Wilderness. And this statue came about after the artist and sculptor Henri Fouques died in 1891, and his wife donated a plaster cast of the statue to the city of Paris, who decided to have this produced in cast iron and iron alloy. It was constructed at the Darenne Foundry, and weighing over 2000 kilograms, this monumental statue of Drama in the Desert was designed in three different pieces and assembled with wrought iron nuts and bolts, then painted with oil paints, and installed within the Square Cambronne. Yet also within the square you can admire the Italian poplars and plane trees or relax in the shade of the chestnut trees on one of the park benches, where you will often find people reading. 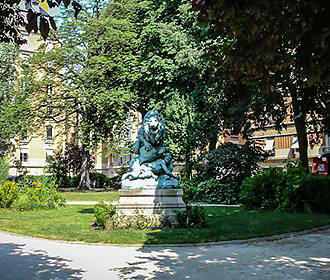 As you will have no doubt read earlier, the Square Cambronne is located opposite the Square Garibaldi, which is in the 15th Arrondissement, and close to many famous tourist attractions in Paris such as the Ecole Militaire. You will find the Square Cambronne open from 8am on weekends and holidays, although it is 9.30am during the weekdays, with closing times varying depending upon the time of year, from as early as 5pm in winter, yet later in the summer months. And the entrance to the square is on the corner of the Boulevard de Grenelle and the Avenue de Lowendal. So when it comes to getting to this square via public transport in Paris, the nearest Metro station is the Cambronne stop that serves line 6, however, you also have the Metro stop called Le Motte Picquet - Grenelle, which serves lines 6, 8 and 10. Yet if you prefer the idea of the Velib self service bike hire scheme, then there are also two stations located close by as well, which are on the Boulevard Garibaldi and the Boulevard de Grenelle. Plus you may be pleased to know that the majority of the area is accessible to the disabled and there is a fresh water point for filling up your water bottles.